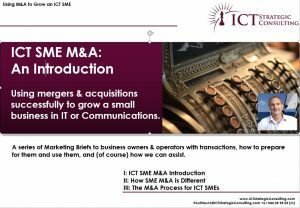 Here’s a basic introduction to the basics of how M&A transactions can be relevant to each of the 4 key stages of growth for our tech SME partners. It’s based on the Australian market, but relevant to others, as well, no doubt. Startup: <$1M revenue – it’s possible to combine businesses attacking the same problem or market, but at this stage, the game is really about proving that your product/service has a good fit to a solid market that you can attack. Larger firms acquiring businesses at this early stage often see it as a hiring decision with a premium, rather than a business acquisition. Proven Product/Service: $1M – $3M revenue – M&A options open considerably at this stage, on both sides. You become a viable acquisition for (somewhat) larger companies looking for a foothold in your market, and there may be other players you can combine with to gain scale. Your value will be considerably higher than as an unproven startup, but capturing your market will rapidly add more value to the business. If you’ve been stuck at this stage for some time, it may be better to look for a counterparty with more effective sales & marketing to help take you forward. Proven Team: $2M – $5M – you’re starting to get some traction in the marketplace with the right people in the right roles; the value of the business will be growing proportionally. Many more options start to open up at this point, but the temptation to expand into too many markets or product/service offerings can easily lead you astray. If you’ve been stuck at this level for too long, it’s generally a sign that the business is being held back by the founder(s), often through a lack of delegation to supporting team members and processes. Proven Business: $5M – $10M – the business has reached a level of maturity with enough critical mass to sensibly attack a new market – possibly a new geography or product/service. Business value has grown considerably as EBIT multipliers increased to this stage, but this effect those multiples tend to stabilise for the next considerable period of growth. This makes it a good time to think about inorganic growth options both to access new markets quickly, and to achieve the considerable scale increase necessary to access even higher multiples through public listing or a more substantial partner. There’s a lot more in the article, and a lot more to learn in person. We’d love to talk about it, no matter which end of the spectrum you’re on. Give us a call today to talk about where you are and what your realistic options might be!